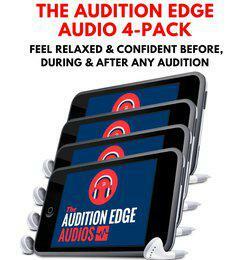 Absolute Audition NO-NOs - Only $14! Want to ADD the Absolute Audition NO-NOs class to your order for just $14? (A $53 savings!) Check the box above to add it now so you'll know why CASTING DIRECTORS don't give you CALLBACKS (even when you're perfect for the part). Limited Time Offer. "Booked it!! After listening to the audition audios and being brave enough to be myself, I booked a co-star, possibly recurring role in my first pilot. Thanks so much Amy for these tools!" "Wow, what a change...I used the audios for the very first time on a callback yesterday. I had the best room experience I've ever had in my life, totally relaxed. Thanks Amy!"